Tyvek is a synthetic plastic material made by DuPont. 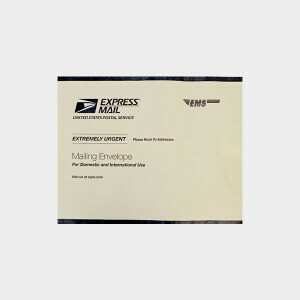 In addition to Priority and Express Mail envelopes, Tyvek is used to make wristbands for concerts, race numbers, CD sleeves, house wrap and protective suits. Having things delivered express has a higher environmental impact than shipping them more slowly. Items shipped overnight are often packed with extra materials, like bleached paper, that usually aren’t reusable. And because of the high CO2 emissions of airplanes, ground shipping is generally the greener choice over air shipping.